We’re celebrating a significant victory for parental rights. Governor Jerry Brown has vetoed AB 1444, the mandatory kindergarten bill! Now I want to you understand why this happened. Then you can apply the same principles to winning more victories for what’s right in God’s sight. The pro-family opposition campaign was initiated and led earlier this year by the California-based Family Protection Ministries and HSLDA. Once AB 1444 passed the Democrat-controlled State Legislature, SaveCalifornia.com stepped in to help and “poured it on.” Thank you to everyone who called and gave of yourselves. Second, this was a window of opportunity to be seized for good. Informed Americans know that the diabolical Islamic army ISIS took over Iraq because Obama had foolishly pulled out U.S. troops — thus leaving a vacuum for them to exploit. Similarly, but with completely opposite values (because we love God and people), SaveCalifornia.com exploited the absence of Democrat “sacred cows” (abortion, “LGBT” agenda, environmentalism, etc. ), which weren’t part of AB 1444. No, AB 1444 was about mandatory kindergarten, pure and simple. On one side, the teacher unions said they know what’s best for children; on the other side, parents said, no way, these are our children and we decide. And I knew that if another parental right fell, liberals won’t think twice about killing off more. In the end, Jerry Brown, who’s already given too much to the teacher unions, who’s well aware he’s running for reelection, and who’s old enough to remember when parental rights were the standard du jour in America, sided with fathers and mothers. See the 5 reasons why Brown was “open” to a veto. This is an important and sweet example that victory must be earned. We expect this in sports, in war, in business, in education, in romance, and in the real world. Likewise, in politics, whatever side works harder will win. 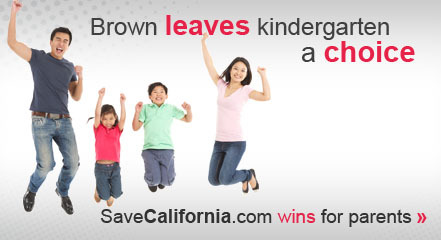 If you did anything to oppose AB 1444, you are part of this victory! If you’re celebrating this wonderful win for parental rights, I invite you to pursue more victories in the present election. It is well worth your time to help a good candidate win, so that they’ll vote right all the time. If you called Jerry Brown to urge his veto of AB 1444, please call a good candidate in your area today. On the phone, schedule yourself to volunteer for just 1 hour at their campaign office. It’s that easy. This election is a historic opportunity for moral conservatives. Liberal voters across America are depressed! In June, complacency and apathy resulted in only 25% of California’s registered voters actually voting — a record low. As I’ve written before, a low voter turnout — which is also expected in the general election now upon us — means a greater opportunity for pro-family victories. When you vote and vote wisely, and work to generate as many good votes as you can in your community and from among your friends — you can win! When you understand that the AB 1444 victory was earned and that all victories require your participation, then you will grow as a people-loving difference-maker, and avoid the non-productive, fatalistic thinking of a mere spectator. Thank you again to everyone who called and donated to SaveCalifornia.com in this important battle. We seized the day and families are the victors!